Cochon: New Orleans, LA – eating my way through Charm City! In the words of a good friend: “You had me at Pig”. I am so glad I had reservations because at about 5:30 – this place was filled to the brim. I still chose a seat at the bar as I was waiting for my friend, but they have full service and Hanna and Miles are quite entertaining. I hope they liked us as much as we liked them. I saw a few plates of the oysters come out, and knew they were the first thing I was ordering. The NOLA style seems to be wood-fired. 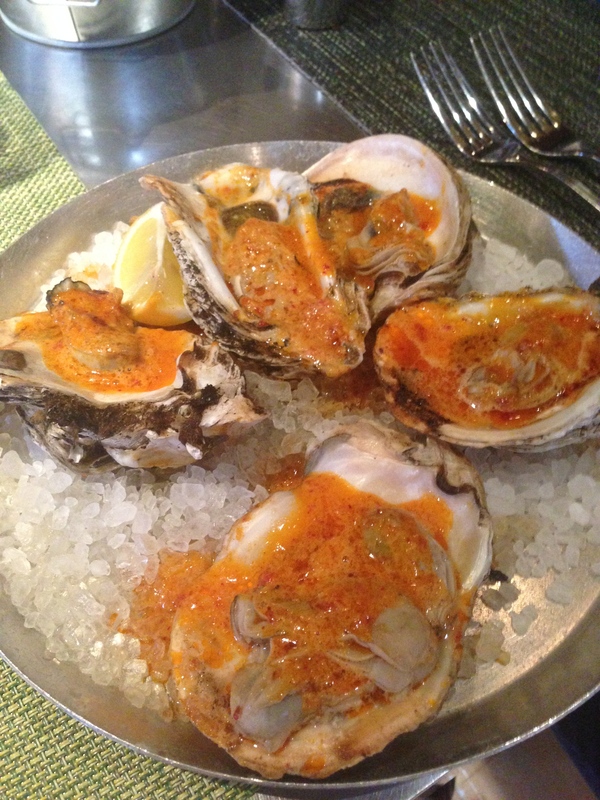 These were outrageous; beautifully cleaned shells with large large large oysters grilled and covered in a balanced chili sauce. I am sure the butter helped temper the heat from the chilis, but they had some kick. Full disclosure, I did sop up every last bit of that sauce with their warmed french bread. Next, we tried the boudin – which is a New Orleans style pork and rice sausage. Cochon removes the casings, rolls it in a little ball and deep-fried it. Then, they serve it with spicy brown mustard and pickled peppers. I loved these; if you are nervous about boudin – try it here first. 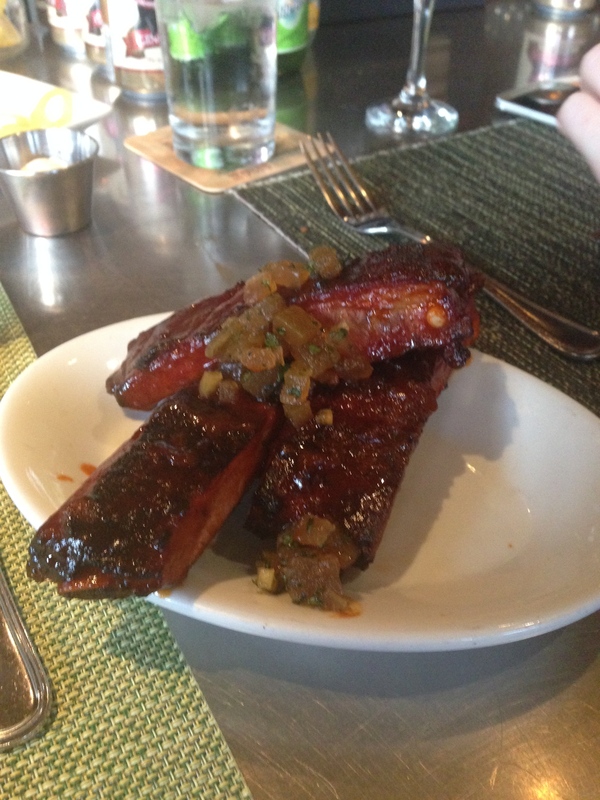 I was intrigued by the ribs because – well this place is called PIG. And, because of the pickled watermelon rinds. I liked these. The bbq sauce was a little thicker and sweeter than I was expecting, but the pickled melon helped cut it. These were fine. Well, more than fine since we quickly devoured them. I probably wouldn’t order them again. It wasn’t my favorite dish of the night; that award goes easily to the oysters. I wasn’t feeling many of the desserts – but we couldn’t pass up the house made ice cream of the day – sour cream and brownie. The sour cream ice cream was incredibly creamy and had natural tartness that complemented the rich dark chocolate brownie chunks; almost an adult version of cookies and cream. 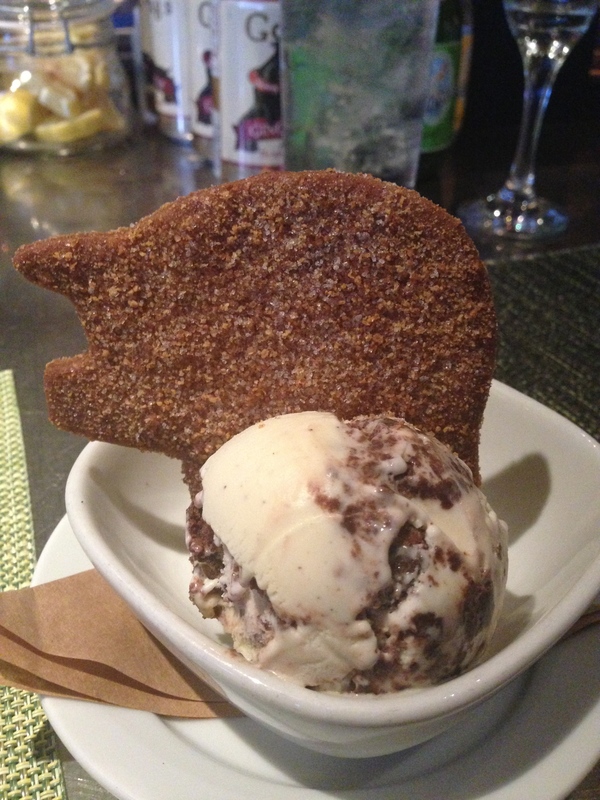 Now for real, look at that adorable pig cookie. It was a thin crisp cookie smothered with cinnamon and sugar. I loved this cookie – it easily broke apart, but it wasn’t super crumbly. It reminded me of a ginger snap or graham cracker consistency. There are a ton of places in this amazing city to try – and we didn’t get to many of the celebrity chef ones – but I’ll definitely go back here on my next trip.